Kate is an associate in the Toronto office of Osler. She advises clients on mergers, acquisitions, dispositions, project development, construction, procurement, transportation and financing matters, primarily in the energy and infrastructure sectors. She also assists clients with general corporate matters. Kate has experience acting for clients on complex, multi-party projects and negotiating and advising on a variety of commercial contractual issues. Kate completed her Juris Doctor at the University of British Columbia after completing a Masters in History of Art at the University of Oxford. 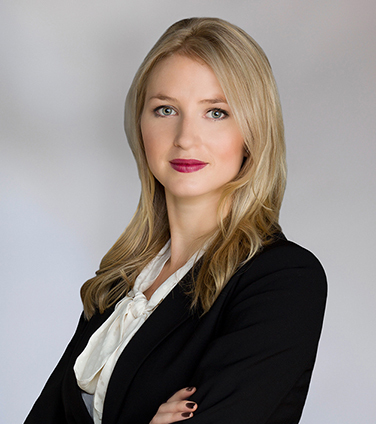 After finishing her articles with the firm, Kate returned as an associate in 2013. Kate is a member of the firm’s Student Committee and Associate Business Development Committee. Shell Canada Limited in its sale of strategic assets to Tourmaline Oil Corp. for $1.369 billion. Totem Capital Corporation in the formation of a new entity and its acquisition of businesses in the organic food industry. Greengate Power Corporation on the sale of an interest in its Wheatland, Paintearth and Stirling wind projects to an undisclosed purchaser. Achilles Media Ltd. on its sale to Brunico Communications Ltd.
Canadian Natural Resources Limited in connection with the sale of certain royalty interests to PrairieSky Royalty Ltd. for $1.8 billion. An undisclosed private company in the acquisition of an Alberta wind project. Imperial Oil in respect of its agreement with Husky Energy to create a single truck transport fuel network of approximately 160 sites. Veresen Inc. in the formation of a new entity, Veresen Midstream Limited Partnership, equally owned by Veresen and Kohlberg Kravis Roberts & Co. LP, which acquired certain natural gas assets from Encana Corporation and the Cutbank Ridge Partnership. Osler also represented the partnership in respect of related financing arrangements. Todd Energy Canada Limited in its incorporation and acquisition of a working interest in the Birch area of British Columbia and all aspects of its engineering, procurement and master service agreements. BG Group in its acquisition of stakes in three exploratory licences for the Newfoundland offshore. Apache Canada Ltd. on the sale of its interest in the Kitimat LNG terminal and Pacific Trail Pipeline to Woodside Petroleum. An international SOE on all aspects of its participation in a proposed LNG project on the West Coast of British Columbia and related infrastructure. Brion Energy Corporation, a Canadian subsidiary of PetroChina, on its partnership with TransCanada Corporation and its affiliates to construct, own and operate the Grand Rapids Pipeline System and its commitment to ship on the system. An undisclosed private company in the acquisition of non-core assets located in south central Alberta from Penn West Petroleum Ltd. for $355 million. Greengate Power Corporation on all aspects of the development of the 300 MW Blackspring Ridge Wind Project and the sale of the Blackspring Ridge Wind Project to Enbridge Inc. and EDF EN Canada Inc. Angle Energy Inc. in connection with its disposition of certain gas-weighted assets near Edson, Alberta, for approximately $74 million. PetroChina in its development of the MacKay River Commercial oil sands project. Canada's Oil Sands Innovation Alliance (COSIA) on the organization and structure of a consortium of oil sands producers focused on improving Canada's oil sands development through innovation. Alberta Law Review, Sole Risk Provisions in Joint Operating Agreements for Unconventional Oil and Gas Development, December 2016 and presented at the Canadian Energy Law Foundation, Jasper Research Seminar, Jasper, June 17, 2016.
International Financial Law Review, Asian SOEs' Future in Canada's Non-Conventional O&G Sector, December 2012.